The CIA director's attempts to justify the attack on Syria's Shai'rat airbase has only raised more doubts and confusion, Syrian politician Saad al-Kassir said in an interview with Sputnik. Speaking to Sputnik, Syrian politician Saad al-Kassir said that the allegations by CIA Director Mike Pompeo about a chemical incident in Syria's Idlib Province earlier this year have nothing to do with reality. Earlier, Pompeo claimed that US intelligence allegedly has "hard evidence" of the Syrian government using chemical weapons in the town of Khan Sheikhoun in Idlib in April. According to Pompeo, following the April 4 chemical incident in Khan Sheikhoun, President Donald Trump demanded that the truth be uncovered.Pompeo said that after Trump's demand the US intelligence community set to work on the issue and held contacts with US partners. — Jean Pascal Zanders (@JPZanders) 6 июля 2017 г. "I told him [Trump] that the intelligence community had concluded that the chemical weapon had indeed been used in the attack and it had been launched by the Syrian regime… I knew that the intelligence community had solid evidence… I said to Mr. President that we have high confidence that this really took place," Pompeo said Tuesday at a dinner hosted by the Intelligence National Security Alliance. 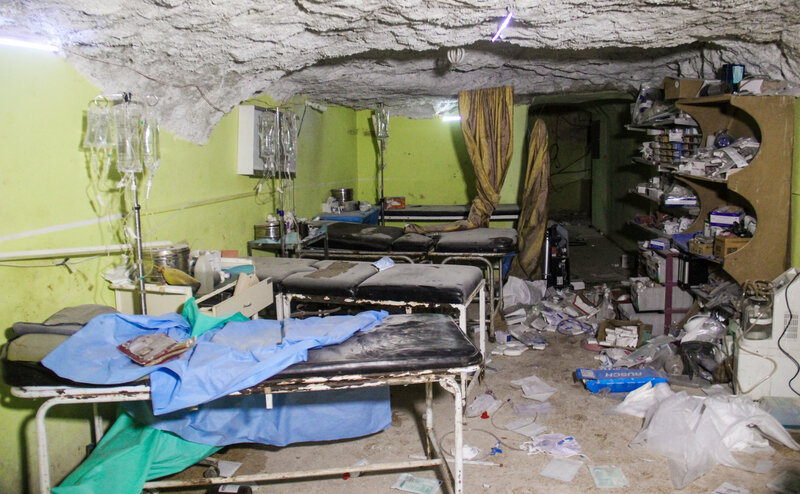 A picture taken on April 4, 2017 shows destruction at a hospital room in Khan Sheikhoun in the northwestern Syrian Idlib province, following a suspected toxic gas attack. Al-Kassir, for his part, described the CIA director's allegations as something that holds no water. "If the US really had such evidence, they would not have concealed it for so long. Evidence should be provided immediately in order to investigate the incident," Al-Kassir said. In his opinion, the CIA director wanted to "save face" by post factum justifying the US attack on Shai'rat, something that eventually put the US in a difficult situation. "After the statement about the available evidence, the Americans will have to provide it because otherwise, it can be regarded as a concealment of evidence, and this is a crime for which the US may be brought to international court," Al-Kassir concluded. On April 4, the National Coalition for Syrian Revolutionary and Opposition Forces supported by the US blamed the Syrian government for an alleged chemical weapon attack in Khan Sheikhoun in Syria’s Idlib province. #US blocking #UN investigation team to go to Idlib 'chemical incident' site in #Syria. Gee, I wonder why the #US is so afraid of the truth. — Boris Malagurski (@malagurski) 20 апреля 2017 г. Reacting to the incident, Washington, which had not presented any proof of the chemical weapons use by Damascus, launched 59 Tomahawk cruise missiles at the Syrian governmental military airfield in Ash Sha'irat on April 6. Why does the OPCW need to take so much time before it sends a proper team of investigators to the site of the chemical incident in Idlib? — LAGenie (@lagenie24) 21 апреля 2017 г.
Damascus has repeatedly denied any involvement in the incident and said that the Syrian government doesn't possess chemical weapons. Moreover, the full destruction of Damascus' chemical weapons stockpile was documented by the OPCW in January 2016. In an interview with Sputnik on April 21, President Assad described the alleged chemical attack in Khan Sheikhoun as a provocation to justify the US strike on Ash Sha'irat. The Syrian leader also warned of the possibility of the new provocations similar to the one in Khan Sheikhoun. Last week, the Russian Foreign Ministry said that terrorists in Syria were planning to stage provocations involving chemical weapons in order to justify US strikes on the Syrian Army and its allies.